Passion Fruit t-shirt Knit Dress- that 70s Vibe!! No actual fruit here. Just that flavor, the color of Koolaid and watermelon on a summer day. Cool indeed because it is a rayon knit that feels cool in any weather. I just wanted to make this dress because I had a feeling for something wild and fun. The colors of the fabric spoke to me and I just went with the design. This t-shirt dress look was made back in February, but I just hadn’t remembered to blog about it until now that I am doing another “Wardrobe Fit-Along” The Knit Tee-Shirt. 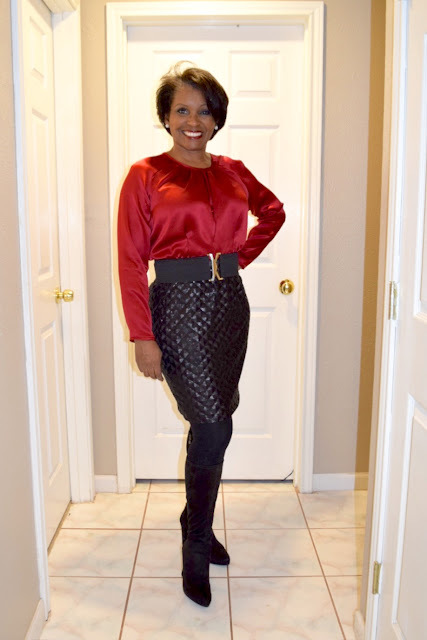 I added the fun flirty “bell” sleeves as another way to show off the double sided qualities that got me to fall in love with this fabric in the first place. I couldn’t decide which side of the fabric to use since it’s a reversible double sided rayon/lycra. It was a dream to sew and even more so a dream to wear. It’s not hot nor heavy. I bought it from “Sew Much Fabric, sold out, but here are a few others that are in cue for me to sew during my Sew-To-Fit Along that I am participating in with my “IRL” and Online sewing groups. The pattern was a Bootstrap pattern basic….a jersey dress sloper. I changed the hem and the sleeves to get the bottom flounce and the bell sleeves. Such a fun look. The neckline wasn’t included in the pattern layout since it was just a sloper. I cut the neckline to my desired size and shape based on my own measurements, and finished it off with a 5/8″ neckband. For the hems, I just folded the fabric over twice and stitched in place. Since it is a two-sided fabric, that created the bias bound contrast I wanted. So, in the case only, being two-faced is a good thing. Have you ever sewn with two sided fabric, how did you maximize its beauty? 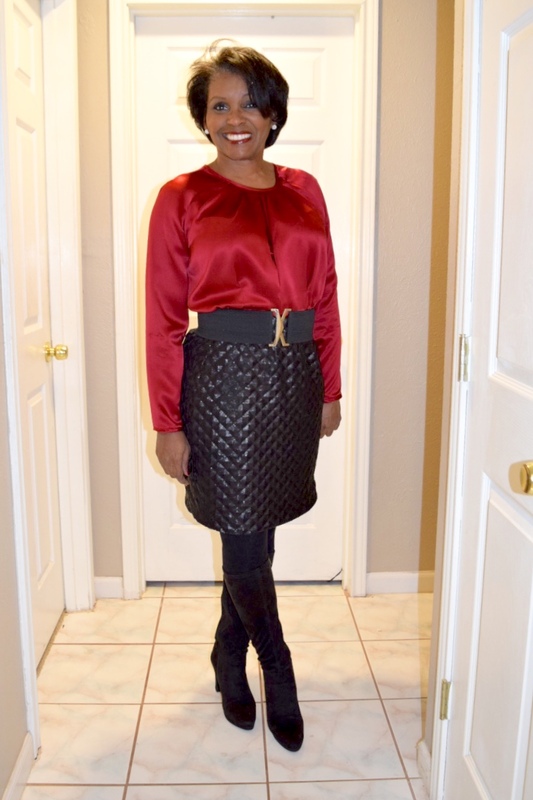 It is said by more than a few stylist in the world of fashion that I should have at least one “fancy” skirt, in this case a sequin skirt for the fun times and events….whether dressed up or down. A piece such as this is a great go to item for any holiday or celebratory occasion. Well, I do as I am told by my wardrobe consultant. See, I made a sequin skirt. Guess what??? I love it!!! I originally wanted to use a basic Mccalls pattern for the skirt. But decided to stick with my high waisted look based off Pamelas Patterns and my own measurements. I just used my hip, waist and length measurement to create the skirt. I included a 2 inch allowance for the top in order to make for a wide sew-on 1.5″ elastic. The sequin fabric is from SMFabrics.com. This fabric is extremely nice. I mean, before working with this sequin, I had a serious phobia against working with sequins. Roz over at SMFabrics took a chance on me and gifted me outright with a cut of such a beautiful luxe fabric. I love it…it does not act anything like the fabric sequins I have had experience using. The pyramid shaping to the sequins gives it such a distinctive look and feel. You can get a discount for watching my Periscopes from SmFabrics, whenever I am displaying one of her fabrics I will give you the code. 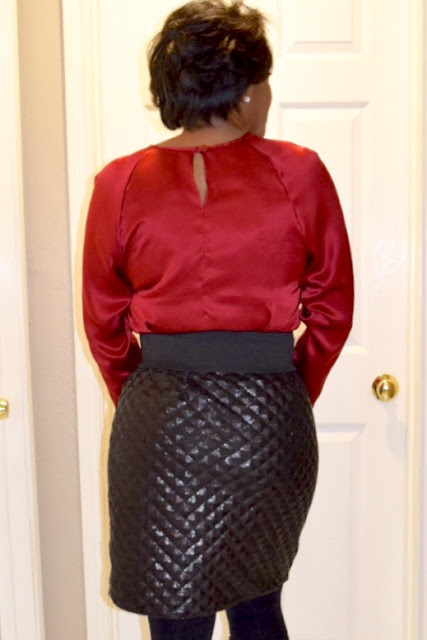 For this one, I give you a sneak peek: its “sewtofit10”.. LoL. Don’t tell. But it is only good unit Monday January 4th. It looks like leather at first glance. The sequins are no more than 1/8″ big and are “stacked”, I mean stacked densely on the knit backing. I was worried about adding the darts to get the shaping and how I would work them in without adding excess bulk. 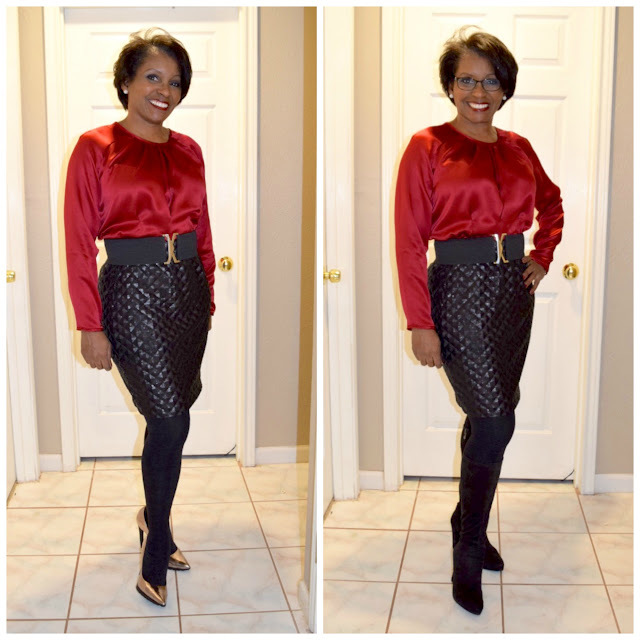 I wore the outfit to a friends new years gathering with the over the knee boots. They were much more comfortable than the heels, although the heels were really cute and a great touch for the overall look. Such fun was had making this wonderful sequin skirt and silk top “live” on periscope. Everyone seems to enjoy immensely the live sewing time I have in my studio. I always have so much to share and show.